Here you'll find an excellent selection of kids hand and finger puppets, including penguins, Kiwis, pirates, dragons and farm animals. Beautifully handmade, each of our kids puppets will encourage kids to role play and interact and provide some great fun and entertainment for themselves and those watching. 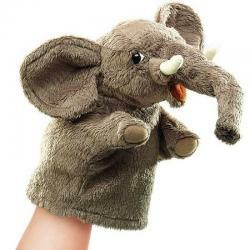 Finger and hand puppets make for a perfect gift idea. Teddykompaniet plush finger puppets in various farm animal designs.Assorted farm animals includ..